Located just uphill from the visitor entrance to Achamore Gardens and the village hall you will find the remains of the former parish church of Gigha and Cara which was dedicated to St Cathan (an Irish missionary of the 6th Century). This church ruin probably dates from the 13th Century, and is decorated with a fine lancet window in the east gable, and a smaller single light window in the north wall. The church appears to have been in use at the time of Martin Martin's visit in 1695, but some time during the early 18th Century it was replaced by a new church sited opposite the current hotel. (A small section of wall of this church can be seen in the hotel car park). The tall, deeply splayed, East lancet window has an incised Latin cross on the left hand side. The existing semicircular head replaces an original pointed arch stone. The medieval font shown on the picture (based on a sketch by Captain T.P.White) is now preserved in the current parish church. 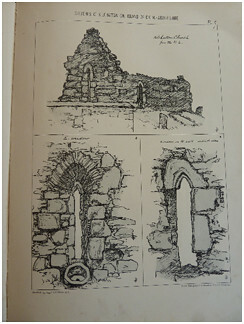 Captain T.P.White also recorded the carved grave slabs which completely fill the church interior in his book “Archaeological Sketches in Scotland:Knapdale and Gigha” (1875). Almost the entire floor is covered with graveslabs. In total there area 33 fragments, some of which have been exposed following the recent conservation work. Some of the slabs are illustrated here. The graveslabs date from the 15th Century or earlier, and they are unique examples containing fine carving. 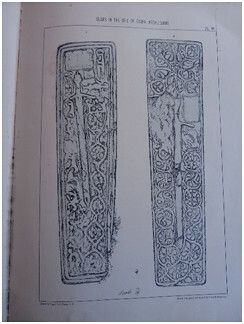 The carving is similar to designs found elsewhere in Knapdale, Islay and Jura. Please look here for a detailed survey of the inscriptions. The stoneslabs are delicate and should not be walked on. Small scale repairs to the chapel were undertaken in the 19th and early 20th Centuries. During the summer of 2010 the church walls were conserved and consolidated, and turf capped. The work also included the addition of stainless steel ties through the North wall and part of the South wall. This work was possible due to the generosity of the islanders, private donors, the Heritage Lottery Fund, and Historic Scotland. The Isle of Gigha Heritage Trust have committed themselves to preserving the site. We would be grateful for any donations to help with the preservation of and access to the heritage sites on Gigha. If you would like to make a donation please contact the Isle of Gigha Heritage Trust Office, tel 01583 505390.